Human Resources have almost two centuries of history with grandfathers Frederick Taylor and Henry Fayol. Overviewing such a long period is impossible to be done in one article. Fast forward to now CourtesyMasters marked 20 years of experience within human resources, executive recruitment and talent management. In the early 21st century, after the arrival of the internet and the increasing alliance of new technologies, business models take a resounding turn. The personnel of the companies, who are now much more qualified to carry out their tasks, are demanding more spaces of participation and decision in the companies. Talent management in hospitality becomes a priority. Human Resources broaden its core of operations. In addition to hiring and firing, they also deal with training, time conciliation, and ultimately everything that relates to the welfare of its people. What remained more or less the same? Even though in twenty years the way of working has changed in many aspects, some fundamentals remained stable. The performance of your hotel, resort or restaurant is dependent by the level of importance put in recruiting the right workforce. Especially now with changing work conditions and evolving demography, there are significant changes. Consider flexible contracts, ageing baby boomers, entering millennials and international staff. It becomes crucial to bring talent on board. – How many candidates applied the previous quarter? – How many employees you have? – What the exact process of applying to your company is? The art is to know how you easily get your metrics and how to apply standardisation in repeating processes. This way you will have your attention entirely focused on the human side of recruiting. 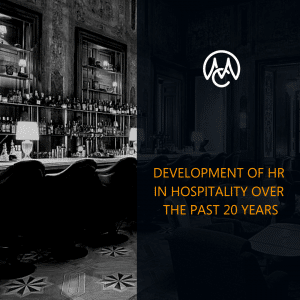 What changed the game of HR in hospitality? The new technologies have provided us with a large number of tools and resources to reach the highest possible talent. In this sense, many opportunities are opening for talent collectors. You have to stay alert to capture the likely candidate, as well as using different technologies and services to hire the best. Spreadsheets and excel documents are exchanged for social media, apps, tools and programs which can cover the line of the first contact until the salary payment. It would be too good to be true for every HR department. But business who are enough advanced in their HR are using tools to cover at least a part of their HR process for talent management. Many of these solutions also provide full integration with email and messaging tools and candidate tracking systems or CRM. Effective evaluation systems are essential to reduce recruitment time and improve the effectiveness of the selection. Anxiety about technology taking over HR jobs is unnecessary because how sophisticated an algorithm may be, it cannot use emotional intelligence to find the individual match. A streamlined HR department –taken serious as being part of the Management Team – and takes care of each HR aspect, employee happiness and looks ahead of developments in the field. Two employees who take care of what is necessary for the employees. Focused on recruitment, selection and payment. HR in its infancy with a relatively un-experienced employee working locally and put in a position along far more responsibilities than he/she can carry. The Jack of all trades let’s say. An additional factor to HR strategy is the arrival of a freelancer and interim force. We see more and more people switch their contract to work on a freelance base in the hospitality business. When is it clever to hire a temporary employee? For example during high season, large events or when you need an interim director or a manager to fill an important function within your company until you find the perfect fit. HR in hospitality and the way talent management changed. Free to download. Looking at the position of talent management in the hospitality business, HR has still a big potential to grow within the hospitality. When everything is taken into consideration, technology is helpful, but the people in it shape your business! I am looking forward to the next 20 years!